A couple of days ago, there was a post by one Patrick Barnes entitled "12 of the Weirdest Secrets of World War 2". Item #7 was "The Last Execution in the Tower of London". Now, you only have to look at the image of Josef Jakobs on my blog to know that the image used in the Compilation 11 post is not of the same man. The author of the post has unhelpfully confused Josef Jakobs, WW2 German spy executed on August 15, 1941 in the Tower of London with Josef Jacobs, WW1 German flying ace who died in Munich in 1978 at the ripe old age of 84. Two very different men. 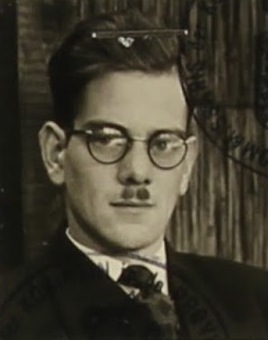 "On August 14, 1941, the German spy Josef Jakobs became the last man to be executed in the Tower of London. He was buried in an unnamed tomb and while his boss Rudolf Hess (the last prisoner in the Tower) is remembered, Jakobs has long been forgotten." The blog post has the wrong execution date - August 14, 1941 - when it was actually August 15, 1941. Rudolf Hess had absolutely no connection with the German Abwehr (German Intelligence Service) and, if we want to get technical, Josef's ultimate boss would have been Admiral Canaris. I have to admit that no one has ever mixed up Josef Jakobs (spy) with Josef Jacobs (WW1 flying ace). The sad tale of Engelbertus Fukken, alias Jan Willem Ter Braak has recently been published in more detail by Jan Willem Van den Braak (no relation). The author's persistent research tracked down relatives of the unfortunate Fukken who filled in some of his background story. Their astonishment at having such an infamous character in their family tree was understandable. Given the secrecy surrounding wartime espionage activities in Britain, shame amongst Fukken's immediate family at his nefarious activities and the obvious language challenges, it would be easy for later family members to dismiss the rumours surrounding the strange uncle/cousin who disappeared during the war. But now that Fukken has stepped from the shadows, his relations are arranging for a marker to be placed on his grave. Our knowledge of Fukken's final resting place is due in large part to the work of Winston Ramsey and After the Battle Magazine. Researching the wartime spies during the mid-1970s, Ramsey had the advantage of speaking with eye witnesses of the events in question. Without Ramsey's dogged research, Fukken's final resting place may have remained unknown forever. "The Coroner who examined the case, Mr. Walter Wallis, died in 1959 and from the enquiries that we made, we found that all his papers have been destroyed. We searched the records at every Cambridge cemetery looking for the entry noting Ter Braak's burial but could find no trace. Once again we seemed to be up against a blank wall, which the passage of thirty years and fading memories did nothing to help. "That is, until we traced Mr. John O'Hannan, a funeral director in Cambridge during the war--the man that buried Ter Braak. It was just prior to Christmas 1974 that the editor went to see Mr. O'Hannan, 76 years old, in poor health for some time, and nearly blind. This is what he told us. "On the morning of April 1, 1941, he received a telephone call from the Cambridge police and was told that a man had been found dead in an air raid shelter. He was asked to come and remove the body but not to mention a word about it (a silence he had kept until we spoke to him). "Reaching Christ's Pieces, he was asked by the police to back his van up to the shelter which he did from Pikes Walk. The Chief Constable, Mr. R.J. Pearson and the Coroner's official lifted the body into Mr. O'Hannan's shell coffin used to transport bodies. "The mortuary at the time was situated in Mill Road (now used as a maternity hospital) and Ter Braak was placed in the small end room which could be locked, rather than the main room. "As Mr. O'Hannan undressed the body with the help of his assistant he was surprised to find Ter Braak was wearing two pairs of trousers. They removed these together with his coat and waistcoat and laid out the body. "When he returned home Mr. O'Hannan was surrounded by reporters (he believes the mortuary attendant at Mill Road gave the story away although he had retained the key to the small room to stop anyone entering). However, Mr. O'Hannan kept his silence and denied any knowledge of the body. "The Chief Constable had told him that when the Coroner's certificate was issued he was to bury Ter Braak in an unknown grave. "On the day the certificate was obtained he was called to another suicide death at nearby Madingly. As reporters were still pestering for information, Mr. O'Hannan decided to switch the body of the woman who had committed suicide with that of Ter Braak. The switch passed unnoticed and Ter Braak was taken to Mr. O'Hannan's funeral parlour at 203 High Street, Chesterton (since demolished) and placed in the back room. "However, within an hour reporters had discovered the switch of bodies and arrived at Chesterton, but Mr. O'Hannan again denied any knowledge. He had already been to Great Shelford, three miles to the south of Cambridge, to see the vicar, the Reverend F.W. Jeeves of St. Mary's Church and the parish clerk. Mr. O'Hannan told them he had the body of a student who had been killed on a motor cycle and whose parents had disowned him. He explained that he wanted a quiet funeral as nobody would be attending. He paid a fee of L3.0.6 to the clerk. "At 9:00 a.m. on April 7, Ter Braak was buried, attended only by the Vicar, the gravedigger, Mr. Duisly the clerk and Mr. O'Hannan. "No official mention was ever made of Ter Braak being a German spy. We found that Reverend Jeeves had since died and when we spoke to the present vicar at St. Mary's, Reverend Hale, he knew nothing of it and had no entry in his records. Until we traced Mr. O'Hannan, the grave could have been lost for ever. Mr. O'Hannan was, in fact, too blind to show us where it was. The grave remains unmarked to the present day when we photographed it with the Parish Clerk, Mr. P.E. Holdrup, in January 1975. We found the entry in the Register of Public Graves recording that L3.0s.6d. was paid for Grave 154." The church referred to in the article is likely Parish Church of St. Mary the Virgin, located in the southwest corner of Great Shelford (blue marker at bottom of image below). While the parish church does have a small churchyard with some older headstones, Engelbertus Fukken (a.k.a. Jan Willem Ter Braak) was NOT buried in St. Mary's Church cemetery. But... thanks to the After the Battle magazine article, at least we are in the right village! and Great Shelford village cemetery (top of image). Information gleaned in the last few years indicates that the grave is actually located in the Great Shelford Cemetery northwest of the village. In a few months (one hopes), a stone will be placed on the grave site and Engelbertus Fukken's final resting place will be marked for posterity. It is one of the only firm pieces of information we have on Fukken during his time in England. Did he manage to contact the Germans via wireless transmitter? Were they supposed to send someone to him with more cash? These questions will likely remain unanswered. I have created a Google Map marking some of the other sites associated with Jan Willem Ter Braak. Great Shelford Online has a short article about Jan Willem Van den Braak's book about Jan Willem Ter Braak. 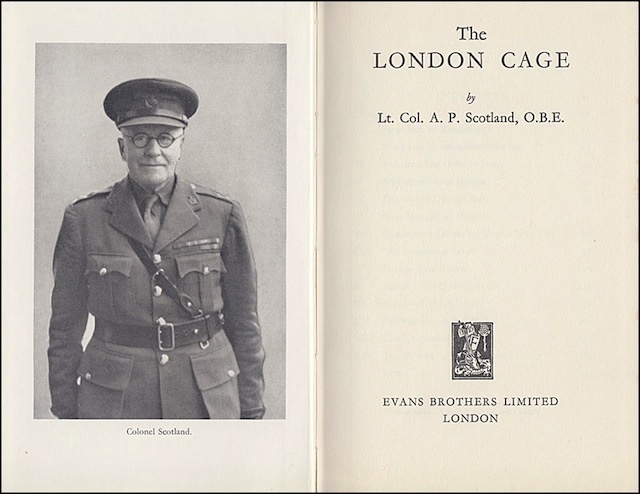 The London Cage; Lt. Col. A.P. Scotland, O.B.E. ; Evans Brothers Limited; London; 1957. 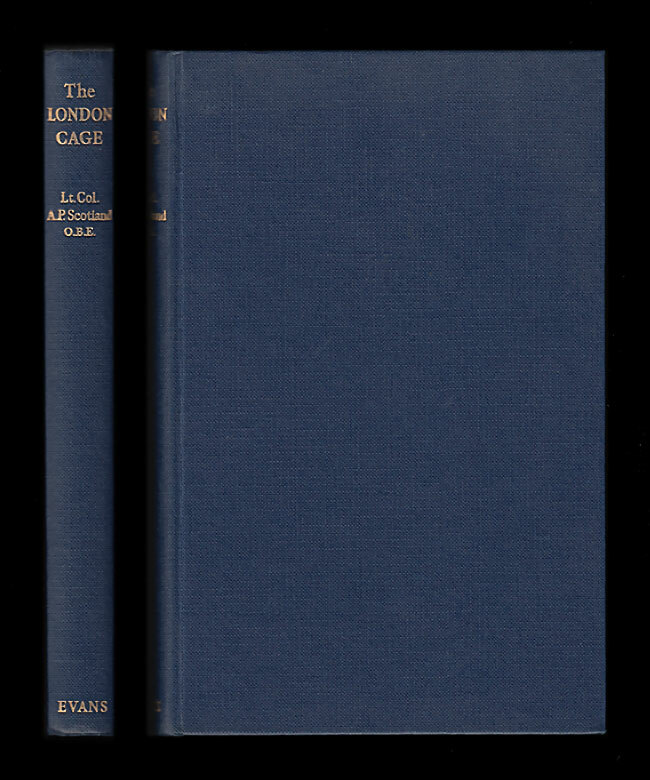 I purchased a copy of The London Cage several years ago and got around to reading it this past week. The London Cage was one of a series of interrogation centres run by MI19. It was commanded by Lt. Col. A.P. Scotland. 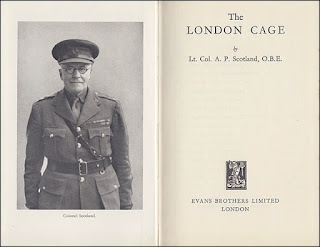 After the war, Scotland wrote the story of the London Cage but ran afoul of the Official Secrets Act. His original manuscript apparently outlined many of the controversial methods he used to extract confessions from the prisoners of war who passed through his hands. After being sanitized, the book was published in 1957. Scotland outlines how he became involved in intelligence work in South Africa, even to the point of serving in the German Army for four years. We learn of his derring-do during World War I when he crossed enemy lines and sniffed out information on the Germans. Much of the book deals with the aftermath of World War 2 and how Scotland and his group sought to extract confessions from suspected war criminals. Given the sanitized nature of the London Cage's interrogation methods, there is actually very little information on the Cage. Scotland spends a fair bit of time outlining the war crimes that took place - the mass murder of Allied troops at Paradis, the execution of 50 Stalag Luft III escapees, and the execution of Italians by the Germans in retaliation for a partisan attack. While Scotland acknowledges that many of the Nazi war criminals claimed torture at his hands, he denies that any took place. Interesting, given the fact that he had initially included so many of the methods in his initial draft. One thing Scotland lamented was that he, as an Intelligence Officer, had been called upon to testify at the war crimes tribunals. He was thereby subjected to questions, harassment, accusations and cross-examination, something he felt no Intelligence Officer should have to undergo. In that respect, the officers at MI5s secret interrogation centre, Camp 020, had an easier time of it, for none of them were ever called to testify at the German spy trials. In fact, the officers of MI5 would do anything to avoid being called by the courts, even to the point of dropping charges against at least one suspect. The book was definitely readable and interesting. I learned quite a bit about some of the war crimes committed against Allied troops by the Germans. I didn't learn a lot about the London Cage, however, and that is disappointing. This article by The Guardian has a nice summary of the saga concerning Scotland's book. Several War Office files at The National Archives relate to the publication of Scotland's book. 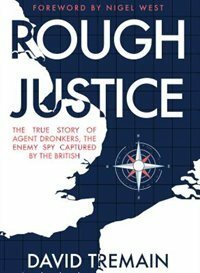 Rough Justice - The True Story of Agent Dronkers, the Enemy Spy Captured by the British; David Tremain; Amberley Publishing; The Stroud, Gloucestershire; 2016. Johannes Marinus Dronkers was a poor sod of a guy. A Dutchman who struggled to make a living in Nazi-occupied Holland, he was an easy mark for the German spy handlers. Dronkers, and two other Dutchmen, sailed for the English coast in a little boat in the spring of 1942. Their boat ran into difficulties and they were eventually picked up by the British. All three of the men underwent serious interrogations and, eventually, Dronkers caved. On December 31, 1942, Dronkers was hanged at Wandsworth Prison. It would seem to be an open and shut case on a very minor World War 2 spy but... author David Tremain has conducted some intense research into Dronkers background and delved into the declassified MI5 files at the National Archives. As with many of the ill-fated men who were "recruited" by the Germans to spy against England, there is more to the story than meets the eye. Rough Justice is meticulously researched and is, therefore, not a book for the first-time espionage reader. However, for someone with a keen interest, in World War 2 espionage, the book makes fascinating reading. I had scanned Dronkers files when I last visited the Archives and had picked out a few things in his interrogations and prosecution that had a bearing on my grandfather's case (Josef Jakobs). It is very nice to see that someone has taken on the case of Dronkers and written a thorough analysis of the case. I highly recommend this book for the reader who has an interest in World War 2 espionage. it reminds one that even the "minor" spies of World War 2 have stories to tell that shed light on the bigger picture of the war. An even more spurious story which is still persistently circulating on the internet is that Dronkers was connected to the 'Hagley Wood Mystery' and the 'Who put Bella in the Wych Elm' claim. It has been alleged that 'Bella' was a Dutch woman named Clarabella who was a Nazi spy, and may have been Dronker's wife, who had been murdered in about 1941 and her body stuffed in a wych elm (really just an elm) in Hagley Wood, part of the Hagley Hall estate, near Kidderminster, in the West Midlands. The story, perpetrated by a number of websites, is so ridiculous that no further discussion is warranted. But whoever she was, she was not Dronker's wife. I came across reference to this book through the HD Paranormal site - the people who are doing a film on Bella in the Wych Elm (due to be released in August 2017). I hemmed and hawed a bit about buying the book but... it was less than $5 and an e-book, so why not. First off... "book" is a bit of a stretch. The e-book has a grand total of 80 pages (that includes the front page, copyright pages, table of contents, further reading, etc). There are also another 46 pages of police file transcripts. This "book" is more like a pamphlet... particularly as the e-book pages are quite short and the font quite large. A paperback version has a grand total of 54 pages. Secondly, the author appears to have accessed some of the Worcester police files and yet these are not referenced. In fact, there are really no references. Given the amount of speculation and supposition that surrounds the Bella case, it would be most helpful if researchers, authors and bloggers would actually cite their sources. Sparke's devotes an entire "chapter" (6 pages which include 2 of photographs) to the Clara Bauerle theory. He refers to Allison Vale's article at length and then debunks the theory by noting (a) the height of Clara (courtesy of descriptions by Karel Richter and Josef Jakobs); (b) her recording career in 1941 and 1942 and (c) the fact that she died in Berlin on December 16, 1942. This information is cleared based on my research work and yet the author makes no reference to sources. Similarly, the author uses photographs that clearly come from the West Mercia police files in the case - including some clear photographs of the skeleton's lower jaw. He also uses that Clara Bauerle post card images from the National Archives website. Again - no references for any of the photographs. Given that the author is selling a book... I would wonder if copyright permission was secured for those images. This book provides a lot of information on the Bella in the Wych Elm case. Unfortunately, since none of the information is sourced, the reader is left wondering what is fact and what is fiction. Given that the author quotes some questionable sources (Donald McCormick's book and Allison Vale's article) side-by-side with what appear to be police files for the case, fact, fiction and speculation end up inextricably intertwined. This is unfortunate as the book, had it cited its references, could have been a great reference for the Bella mystery. As it stands, it is a disappointment.